The high powered Ducks offense is back after losing to Auburn in the championship game. 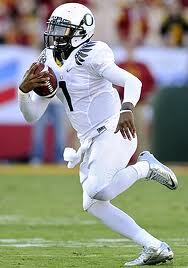 They will return star junior Darron Thomas who not only can pass but his scrambing ability makes him a dual threat. 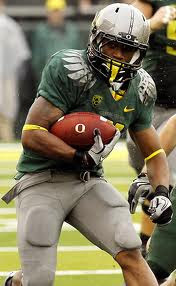 LaMichael James is probably the best running back right now in college football. Not only does he have speed he can run over you. Kenjon Barner is another guy in the backfield that Oregon can use occasionally. Thomas' options are more limited now after the graduation of Jeff Maehl. Luckily, the Ducks do return senior Lavasier Tunei and junior Justin Hoffman. The O-Line also must regroup, losing two starters on it. Senior tackle Darrion Weems. Tight end David Paulson is more of a recieving option but he can also block for the running game. On defense, the Ducks defense is actually underrated. The line only returns one starter(senior end Terrell Turner) but the coming in guys are capable. Oregon lost Casey Matthews in the middle but still has talent. The secondary is loaded. All Conference Selection Cliff Harris is a beast at cornerback and Eddie Pleasent makes plays. John Boyett is one of the most underappreciated players in the Pac-12.